Can capacitors be exposed to temperatures above the max. operating temp? I have an NVIDIA GeForce 7300LE graphics card that's having problems (see here), and I heard about baking the card to restore old solder joints. The thing is, this involves putting the card in the oven at 385 oF (200 oC) for 10 minutes and the capacitors on the board are rated to 105o C operating temp and I don't know if they would be damaged by the high temps. Would the 385o temps damage the caps or plastic connectors on the board, or would it be fine? The formula I gave suggests a 5% reduction in lifetime under those conditions over 8 minutes. That would almost certainly be so far outside the sensible range of use as to ber very very very approximate - but shows how extreme even 196C is compared to 105C. Unless the board is otherwise a complete write off, don't even think about it. Apart from the effect on the capacitor the process will cause major damage to other components - see below. Aluminium "wet" electrolytics have a electrolyte with a boiling point roughly the same as water has. While some capacitors are made to withstand temperature will above water boiling point, most aren't. There is an extremely good chance of inflicting major damage to the capacitors. 2000 hours x 1/2^((385-105)/10) = about 1/500th of a second :-)!!!. They'll last a bit longer than that, but you get the idea, I'm sure. BUT if you REALLY want to try, see the suggestion at the end. Even if it is wholly dead there are other things you can do which have more chance of fixing it. What you propose has a very good prospect of doing major permanent damage. Any plastic component on the board will melt below that temperature. Of all the plastics you are liable to encounter only two have continuous service temperatures above water boiling point (100C / 212 F) - those are PTFE and PEEK and you will have little or none of either on your board. (Just maybe some PTFE in a connector). Resoldering all the solder joints that you can get to MAY have a better effect. There is no guarantee that the page you cited tells a genuine story. I have seen pages which make the most outrageous and certainly untrue claims complete with step by step instructions on how you too can waste time and money following their example. Take a board that you do not value at all. Ideally with enough connectors etc to be vaguely similar in content type to the one you are thinking of incinerating. Try it in the oven at the temperature that they suggest for the time that they suggest. The page you link to talks about 385° Fahrenheit, not Celsius. 385°F is about 200°C. The preheat phase is the longest, and NXP recommends a maximum of 8 minutes for this. Heating to 200°C for 10 minutes for a second time probably won't ruin your capacitors, but it may reduce their life. 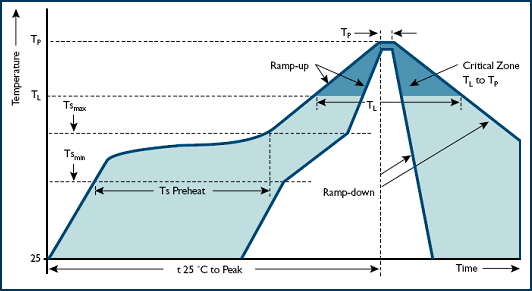 The most important, however, is the peak temperature phase, where the temperature goes for a short time (about half a minute) to about 250°C, depending on package volume. This is the phase where the actual soldering takes place. Just the preheat phase may not be sufficient to cure the solder joints. Just to report a personal experience. I had a laptop with the same problem in the video chipset (nVidia GeForce 7000m), which (apparently for bad use of the lead-free solder) in many cases had shown instability due to the cracking of the solder balls under the chip itself. This worked for 3 or 4 times, and then I've started having a different problem, and changed laptop. But the damages I caused in the board were only some plastic supports for screws detached from the board. But do that only if necessary, because it will hopefully give some more life to the board (in my case almost a year) but you don't know. And do that only if you are sure that the problem is solder cracking. Not the answer you're looking for? Browse other questions tagged capacitor connector soldering temperature surface-mount or ask your own question. remove all components from a board with oven/heater? Can someone help me identify what the value of this capacitor is?